For the wreath used in heraldry, see torse. A wreath (/riːθ/) is an assortment of flowers, leaves, fruits, twigs, or various materials that is constructed to form a ring. In English-speaking countries, wreaths are used typically as household ornaments, most commonly as an Advent and Christmas decoration. They are also used in ceremonial events in many cultures around the globe. They can be worn as a chaplet around the head, or as a garland around the neck. Wreaths have much history and symbolism associated with them. They are usually made from evergreens and symbolize strength, as evergreens last even throughout the harshest winters. Bay laurel may also be used; bay laurel wreaths are known as laurel wreaths. The word wreath comes from Middle English wrethe and from Old English writha, band. Wreath with ivy leaves and berries, a satyr's head at either end. Gold sheet, Etruscan artwork, 400–350 BC. From a tomb near Tarquinia. Wreaths were a design used in ancient times in southern Europe. The most well-known are pieces of Etruscan civilization jewelry, made of gold or other precious metals. Symbols from Greek myths often appear in the designs, embossed in precious metal at the ends of the wreath. Ancient Roman writers referred to Etruscan corona sutilis, which were wreaths with their leaves sewn onto a background. These wreaths resemble a diadem, with thin metal leaves being attached to an ornamental band. Wreaths also appear stamped into Etruscan medallions. The plants shown making the wreaths in Etruscan jewelry include ivy, oak, olive leaves, myrtle, laurel, wheat and vines. Wreaths were worn as crowns by Etruscan rulers. 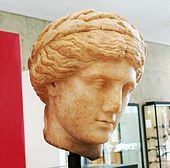 The Etruscan symbolism continued to be used in Ancient Greece and Rome. Roman magistrates also wore golden wreaths as crowns, as a symbolic testament to their lineage back to Rome's early Etruscan rulers. Roman magistrates also used several other prominent Etruscan symbols in addition to a golden wreath crown: fasces, a curule chair, a purple toga, and an ivory rod. In the Greco-Roman world, wreaths were used as an adornment that could represent a person’s occupation, rank, their achievements and status. The wreath that was commonly used was the laurel wreath. The use of this wreath comes from the Greek myth involving Apollo, Zeus’ son and the god of life and light, who fell in love with the nymph Daphne. When he pursued her she fled and asked the river god Peneus to help her. Peneus turned her into a laurel tree. From that day, Apollo wore a wreath of laurel on his head. Laurel wreaths became associated with what Apollo embodied; victory, achievement and status and would later become one of the most commonly used symbols to address achievement throughout Greece and Rome. Laurel wreaths were used to crown victorious athletes at the original Olympic Games and are still worn in Italy by university students who just graduated. Other types of plants used to make wreath crowns also had symbolic meaning. For example, oak leaves symbolized wisdom, and were associated with Zeus, who according to Greek mythology made his decisions while resting in an oak grove. The Twelve Tables, dating to 450 BC, refer to funeral wreaths as a long-standing tradition. Olive wreath was the prize for the winner at the ancient Olympic Games. Harvest wreaths, a common household decoration today, are a custom with ancient roots in Europe. The creation of harvest wreaths in Europe can be traced back to ancient times, and is associated with animistic spiritual beliefs. In Ancient Greece, the harvest wreath was a sacred amulet, using wheat or other harvested plants, woven together with red and white wool thread. The harvest wreath would be hung by the door year-round. Harvest wreaths were an important symbol to the community in Ancient Greece, not merely to the farmer and his family. The festivals devoted to Dionysus, the Oschophoria and Anthesteria, included a ritual procession called the eiresîonê. A harvest wreath was carried to Pyanopsia and Thargelia by young boys, who would sing during the journey. The laurel or olive wreath would be hung at the door, and then offerings were made to Helios and the Hours. It was hoped that this ritual would bring protection against crop failure and plagues. In Poland, the harvest wreath (wieniec) is a central symbol of the Harvest Festival, Dozynki. Wreaths are made of different shapes and sizes, using harvested grain plants, fruit and nuts. The wreath is then brought to a church for a blessing by a priest. The tradition includes a procession to the family home from the church, with a girl or young woman leading the procession and carrying the wreath. The procession is followed with a celebration and feast. Ukraine, Hungary, and other Eastern Europe cultures also have similar rituals that began as part of pre-Christian culture. In Christianity, wreaths are used to observe the Advent season, in preparation for Christmastide and Epiphanytide, as well as to celebrate the latter two liturgical seasons. These wreaths, as with other Advent and Christmas decorations, are often set up on the first Sunday of Advent, a custom that is sometimes done liturgically, through a hanging of the greens ceremony. The Advent wreath was first used by Lutherans in Germany in the 16th century, and in 1839, Lutheran priest Johann Hinrich Wichern used a wreath made from a cart wheel to educate children about the meaning and purpose of Christmas, as well as to help them count its approach, thus giving rise to the modern version of the Advent wreath. For every Sunday of Advent, starting with the fourth Sunday before Christmas, he would put a white candle in the wreath and for every day in between he would use a red candle. The use of the Advent wreath has since spread from the Lutheran Church to many Christian denominations, and some of these traditions, such as the Catholic Church and Moravian Church, have introduced unique variations to it. All of the Advent wreaths, however, have four candles, and many of them have a white candle in the centre, the Christ candle, which is lit on Christmas Day. Advent and Christmas wreaths are constructed of evergreens to represent everlasting life brought through Jesus and the circular shape of the wreath represents God, with no beginning and no end. Advent and Christmas wreaths are now a popular symbol in preparation for and to celebrate the coming of Christ, with the former being used to mark the beginning of the Christian Church’s liturgical year and both serving as décor during Advent and Christmas festivities. While Advent wreaths are erected on stands or placed on tables, Christmas wreaths are often hung on doors or walls. Within Advent, the Church observes Saint Lucy's Day, the memorial of Saint Lucy, who is said to have brought "food and aid to Christians hiding in the catacombs" using a candle-lit wreath to "light her way and leave her hands free to carry as much food as possible"; as such, on this day, many young Christian girls dress as Saint Lucy, wearing a wreath on their head. The symbolism of wreaths has been used at funerals since at least the time of Ancient Greece, to represent a circle of eternal life. Evergreen wreaths were laid at the burial place of early Christian virgin martyrs in Europe, the evergreen representing the victory of the eternal spirit over death. In early modern England, a wreath custom existed for the funerals of "young maidens". A young woman of the same age as the one being mourned would lead the funeral procession, carrying a wreath of white flowers to represent the purity of the deceased, and "that eternal crown of glory reserved for her in heaven". By the Victorian era, the symbolism of flowers had grown to become an elaborate language, and the symbolism of funeral wreaths was no exception. Flowers represented life and resurrection. Specific flowers were used in funeral wreaths to represent particular sentiments. Cypress and willow were used for crafting wreath frames, and were associated with mourning by the Victorians. Wreaths are commonly laid at the tombs of soldiers and at memorial cenotaphs during Memorial Day and Remembrance Day ceremonies. Wreaths may also be laid in memory of persons lost at sea, either from an accident or due to navy action. In a memorial service at sea, the wreath is lowered to the water and set adrift. A wreath may be used as a headdress made from leaves, flowers and branches. It is typically worn in festive occasions and on holy days. Wreaths originally were made for use with pagan rituals in Europe, and were associated with the changing seasons and fertility. Christianity accepted the symbolism of the wreath based upon its Roman association with honour and moral virtue. During the Middle Ages, Christian art featured depictions of the Virgin Mary and various saints crowned with wreaths, much as figures from Roman and Greek mythology were depicted wearing wreaths, as well as Roman and Greek rulers and heroes. Wreath customs in Europe have survived over many centuries. The observance of May Day in England includes Maypole festivities, culminating in a race by young unmarried men to climb to the top of the Maypole to capture the May Day wreath perched at the top of the pole. The winner of this contest would wear the wreath as his crown, and would be recognized as the May Day King for the rest of the holiday. Plants traditionally used to make Midsummer wreaths and garlands include white lilies, green birch, fennel, St. John's Wort, wormwood, vervain and flax. The flowers used in making the Midsummer wreath had to be picked early in the morning before the dew had dried; the belief was that once the dew dried, the magical properties of the plants evaporated with the dew. Midsummer celebrations are still observed in Germany and Scandinavia as well, with Maypoles and wreaths playing a prominent role, similar to England. By the Renaissance period, wreaths became symbols of political and religious alliances in England. Protestant reformers such as the Puritans saw wreaths and the holidays they were associated with, such as May Day, as being pagan corrupting influences that destroyed healthy Christian morality. Soldiers confiscated wreaths in Oxford on May Day of 1648. During the Interregnum following the overthrow of Charles I of England, wreaths symbolized Royalist sympathies. In Bath, Somerset, the coronation of Charles II of England was marked with a procession of 400 maidens in white and green, carrying "gilded crowns, crowns made of flowers, and wreaths made of laurel mixed with tulips", and led by the mayor's wife. Saint Lucy is traditionally depicted in Christian artwork wearing a wreath as a crown, and on the wreath stand lit candles symbolizing the light of the world represented by Christ. Sweden in particular has a long history of observing Saint Lucy's Day (St. Lucia's Day). "St. Lucia's crowns", made of a brass wreath holding candles, are part of the customs associated with this holiday. A wreath laying ceremony is a traditional practice during which funeral wreaths are laid at a grave or memorial site. It is done as a formal sign of respect towards a particular tribute (e.g. Tomb of the Unknown Soldier, National Memorial). These are formal ceremonies that involve high ranking dignitaries such as heads of state. Once a wreath is layed, the person who lays the wreath goes a few steps back to bow/salute the memorial. During wreath laying ceremonies of a military nature, bugle calls such as "Last Post", "Taps", or "Sunset" are played. In the Netherlands, wreath laying (Dutch: Kranslegging) is usually held during the National Remembrance Day celebrations on 4 May. During state visits, a wreath is laid out at the National Monument in Amsterdam. In Russia, it is tradition to lay wreaths at war memorials on Days of Military Honour and commemorative military holidays, such as Defender of the Fatherland Day and Victory Day. One of the more notable laying of wreaths takes place at the Tomb of the Unknown Soldier in Moscow's Alexander Garden, where the President of Russia, the Prime Minister of Russia, members of the Federal Assembly, military officers, religious leaders in the Russian Orthodox Church and other dignitaries are led to lay a funeral wreath close to the eternal flame. A moment of silence is then conducted, which is usually followed by a solemn march of an honour guard passes. 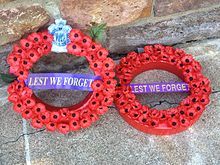 In the United Kingdom, wreaths, are most notably laid at the Cenotaph during the National Service of Remembrance on Remembrance Day. ^ a b "Wreath". The Free Dictionary By Farlex. Retrieved 2012-05-19. ^ Higgins, Reynold Alleyne (1980). Greek and Roman Jewellery. University of California Press. p. 150. ISBN 978-0-520-03601-7. ^ Deppert-Lippitz, Barbara; Bromberg, Anne R.; Dennis, John (1996). Ancient gold jewelry at the Dallas Museum of Art. Dallas Museum of Art in association with the University of Washington Press. p. 39. ISBN 978-0-936227-19-1. ^ Hadas, Moses (1952). A History of Latin Literature. Columbia University Press. p. 7. ISBN 978-0-231-01848-7. ^ a b c Batchen, Geoffrey (2006). Forget Me Not: Photography and Remembrance. Princeton Architectural Press. p. 92. ISBN 978-1-56898-619-7. ^ "Crowning glories". Retrieved October 25, 2016. Six graduates of SAIS' Bologna Center joined the long tradition on May 29, when they, too, were crowned with the aromatic green wreaths. ^ Hastings, James (2003) . Encyclopedia of Religion and Ethics, Part 16. Kessinger Publishing. p. 778. ISBN 978-0-7661-3693-9. ^ Mitchell-Boyask, Robin (2008). Plague and the Athenian imagination: drama, history and the cult of Asclepius. Cambridge University Press. pp. 50–1. ISBN 978-0-521-87345-1. ^ Zamojska-Hutchins, Danuta (2002). Cooking the Polish Way. Lerner Publications. pp. 16–17. ISBN 978-0-8225-4119-6. ^ Normark, Helena (1997). Modern Christmas. Graphic Garden. Christmas in Sweden starts with Advent, which is the await for the arrival of Jesus. The symbol for it is the Advent candlestick with four candles in it, and we light one more candle for each of the four Sundays before Christmas. Most people start putting up the Christmas decorations on the first of Advent. ^ Rice, Howard L.; Huffstutler, James C. (1 January 2001). Reformed Worship. Westminster John Knox Press. p. 197. ISBN 9780664501471. Another popular activity is the "Hanging of the Greens," a service in which the sanctuary is decorated for Christmas. ^ Colbert, Teddy (1996). The Living Wreath. Gibbs Smith. ISBN 9780879057008. It is believed that the European advent wreath began as a Lutheran innovation in the sixteenth century. ^ Mosteller, Angie (2008). Christmas. Itasca Books. p. 167. ISBN 9781607910084. The first clear association with Advent is generally attributed to German Lutherans in the 16th century. However, another three centuries would pass before the modern Advent wreath took shape. Specifically, a German theologian and educator by the name of Johann Hinrich Wichern (1808-1881) is credited with the idea of lighting an increasing number of candles as Christmas approached. ^ Manning, Kathleen (25 November 2015). "Why are Advent candles pink and purple?". U.S. Catholic Magazine. Retrieved 31 January 2016. The modern Advent wreath, created in 19th-century Germany by Johann Hinrich Wichern, featured red and white candles. While these colors may be more in keeping with traditional Christmas décor, they were most likely used because they were just what was available. A Lutheran pastor, Wichern was actively involved in the Inner Mission movement, which promoted the development of social service organizations for the poor. In 1839 students at a school Wichern established for poor boys in Hamburg kept asking him when Christmas would arrive. Using an old cart wheel, Wichern crafted a wreath of four large white candles, with small red candles between them. The children would light a new candle each day, and a new white candle on each of the four Sundays of Advent. When all the candles had been lit, it was time to celebrate Christmas. ^ Brighenti, Kenneth; Trigilio, Jr., John (1 January 2007). The Catholicism Answer Book. Sourcebooks. p. 369. ISBN 9781402232299. Historically, the Advent wreath is a Lutheran custom dating back three hundred years ago. ^ Bower, Peter C. (1 January 2003). The Companion to the Book of Common Worship. Geneva Press. p. 98. ISBN 9780664502324. It apparently emanated from the Lutheran tradition, but it has been appropriated by almost all other traditions. ^ Manning, Kathleen (25 November 2015). "Why are Advent candles pink and purple?". U.S. Catholic Magazine. Retrieved 31 January 2016. Other Christian churches soon adapted the wreath for their own needs and understandings of the season. To reinforce the symbolism of the liturgical vestments worn by priests, Catholics swapped the red candles for three purple candles—the color typically associated with penance—and one pink, the color of rejoicing worn on the third Sunday of Advent. In Orthodox Christian churches, where the observance of Advent lasts 40 days, the wreath has six candles that are green (faith), blue (hope), gold (love), white (peace), purple (penance), and red (communion). Members of the Moravian Church use four plain beeswax candles that can be made at home, reflecting a faith tradition that values simplicity and domestic work. ^ Garrison, Greg (27 November 2010). "Birmingham Catholic Bishop Robert J. Baker writes Advent devotional". The Birmingham News. Retrieved 31 January 2016. An Advent wreath is traditionally made of evergreens in a circle, symbolizing God's unending love. It includes three purple candles, and the candle for the third week of Advent is pink in most Advent wreaths. It signifies the hope of the coming of Christ, Baker said. "Hope is needed in our culture," Baker said. "People are struggling economically. People are in dire need of hope." For Christians, that hope comes from the birth of Jesus, he said. For the first week, there is one purple candle lit on the Advent wreath every day. Another is added the second week. A pink candle is lit the third week, another purple candle the fourth week. The three purple candles and the pink candle are all lit on the last Sunday before Christmas and throughout that week. A white candle at the center of most Advent wreaths, the Christ candle, is lit on Christmas day, Baker said. ^ Mosteller, Angie (2008). Christmas. Itasca Books. p. 167. ISBN 9781607910084. Wreaths became distinctly Christian in their symbolism. Since their circular shape had no beginning or end, they could serve as a reminder of the 'Eternal God' (Genesis 21:33) and the life without end offered to 'whoever believes in the Son' (John 3:36). Since wreaths were made of evergreens (trees that survive the 'death' of winter), they could symbolize both the immortality of God and the souls of men. Lastly, the light of a wreath could represent Jesus, who said, 'I am the light of the world' (John 8:12). ^ Cook, David C. (2006). The Inspirational Christmas Almanac. Honor Books. p. 88. ISBN 9781562927431. From the earliest days of Christianity, the evergreen wreath has always been an emblem of eternal life and God's faithfulness to all humanity. Holly, with its green leaves, its prickly points, and its red berries, suggested that the Child born in the manger would wear a crown of thorns and shed drops of blood. Mistletoe, long associated in the pre-Christian world with healing, became a symbol of the healing power of Christ. ^ Geddes, Gordon; Griffiths, Jane (2002). Christian Belief and Practice. Heinemann. p. 97. ISBN 9780435306915. The wreath's circle reminds Christians of God's endless love and mercy. The evergreen leaves represent the hope of eternal life brought by Jesus Christ. The candles symbolize the light of God coming into the world through the birth of Jesus Christ. ^ Hull, Richard J. (1 July 2001). Advent Conversations. CSS Publishing. p. 35. ISBN 9780788018367. Typically, in sanctuary use, the Advent wreath is placed on a stand in or near the chancel. The home wreath usually is placed flat on a table suitable for a home worship center, with the candles upright. ^ Barnhill, Carla. "St. Lucy's Day". Issue 103. Christian History Magazine. ^ Hanson, Joelle (13 December 2012). "Santa Lucia Day traditions". ELCA. Retrieved 12 December 2015. Lucia means "light" and Santa Lucia became associated with light. In northern Europe, particularly Scandinavia, her day fell on the shortest day of the year and was celebrated as they turned from the long winter nights and began to look forward to longer days. During the Roman persecutions, Lucia is said to have carried food to the poor in dark tunnels, wearing a wreath of candles on her head. ^ Bommer, Paul (2010). "December 13 St. Lucy's Day". St. Nicholas Center. Retrieved 12 December 2015. This timing, and her name meaning light, is a factor in the particular devotion to St. Lucy in Scandinavian countries, where young girls dress as the saint in honor of the feast. Traditionally the oldest daughter of any household will dress up in a white robe with a red sash and a wreath of evergreens and 12 lighted candles upon her head. Assisted by any siblings she may have, she then serves coffee and a special St Lucia bun (a Lussekatt in Swedish) to her parents and family. The Lussekatter or Lussebollar are spiced buns flavoured with saffron and other spices and traditionally presented in the form shown in the image, an inverted S with two raisins a-top (perhaps representing St Lucy's plucked out eyes!?). ^ Hulme, Frederick Edward (1877). Bards and blossoms; or, The poetry, history, and associations of flowers. Oxford University: Marcus Ward & Co. pp. 50–1. ^ Goody, Jack (1993). The Culture of Flowers. CUP Archive. p. 201. ISBN 978-0-521-41441-8. ^ Ferreira, Jorge; Janick, Jules (2009). "Data sheet about Artemisia annua" (PDF). Purdue University. Retrieved 24 August 2013. ^ Simmons, Adelma Grenier (1994). A world of wreaths from Caprilands: the legend, lore, and design of traditional herbal wreaths. JG Press. p. 17. ISBN 978-1-57215-000-3. ^ a b Goody, Jack (1993). The Culture of Flowers. CUP Archive. p. 202. ISBN 978-0-521-41441-8. ^ Simmons, Adelma Grenier (1994). A world of wreaths from Caprilands: the legend, lore, and design of traditional herbal wreaths. JG Press. p. 69. ISBN 978-1-57215-000-3. Look up wreath in Wiktionary, the free dictionary. Wikimedia Commons has media related to Wreaths. Wikimedia Commons has media related to Wreath laying ceremony. Saunders, Rev. William. "The History of the Advent Wreath". catholiceducation.org. Archived from the original on 18 October 2014. "The History of Laurel Wreath". liza-kliko.com. This page was last edited on 4 April 2019, at 16:57 (UTC).